Pressing the juice from the apple pulp (pommace) is an essential step in the cider making process. A homemade or shop bought press is an essential tool. 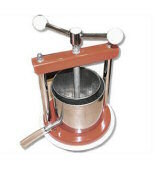 Homemade fruit presses are traditionally made by craftsmen from oak or other hard woods. An apple press normally a large vertical frame with a big screw threaded spindle moving down to squeeze the pommance between wooden horizontal plates. Such items are works of art as well as tools, but the construction time and cost mean that apart from a few exceptions, these have generally disappeared these days. For modern professional, industrial-scale apple pressing many presses work by filling a heavy metal drum with lots of holes in it (like a giant washing machine drum) with the pommace. A thick rubber ball is inflated with water from the middle of the drum, pushing the pulp to the sides, where the juice flows from the holes. This hydraulic method produces a lot of pressure is certainly effective at extracting as much juice as possible, but building a hydraulic press is a bit much for small scale amateur cidermaking. For the rest of us a small fruit press is the best option. These are basically a minaturised combination of the two types of fruit press mentioned above. A screw pushes a plate down onto the pommace which sits in a holed basket. The juice runs through the holes, into a container fitted with a siphon tube. If you raise the press off the floor by at least a foot (preferably two), the juice can pour out and into a container. Once you have enough apple juice you can start the next stage of making you own home made cider, which is fermentation. However, these small steel presses are both small and expensive, whereas a bit diy can take your cider making to a whole new level. Here are my plans for a small domestic cider press that can be taken to pieces for storage with total ease. Firstly the base of the press is made from a Wooden stool. 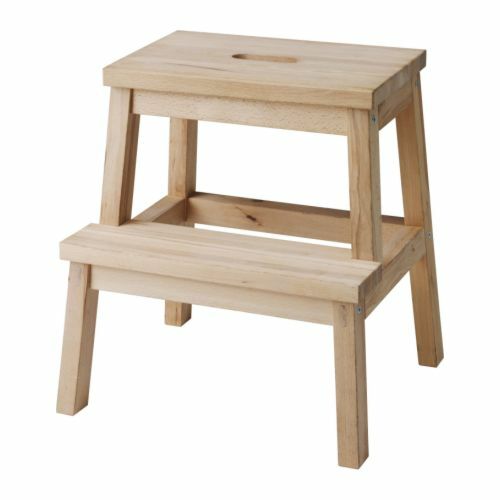 This BEKVÄM Step stool from IKEA costs under a tenner and is the perfect size and shape. If making your own equipment isn’t for you, head over to Cidermaker.com for deals on off-the-shelf cider making tools.